By taking an engineered approach to designing, manufacturing, and delivering a water pull for the specific work challenges you face, we will help you safely dive into the job at hand. 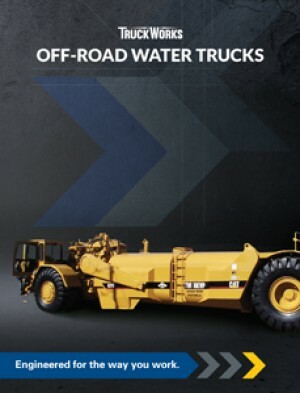 Water pulls take the collection, transmission, and delivery of water to the next level. Your water pull not only needs to complete the same service as a water truck, but must perform on a larger and more efficient scale. For you to get the job done right, you need a reliable water pull suited with the proper heavy machinery, and by coming to TruckWorks you get just that. With years of experience as a leader in the tanker manufacturing industry, we have continuously improved the quality and design of all types of off-road water trucks. We offer tanks to fit a variety of models: water pulls ranging from 5,000 to 10,000 gallon capacity and articulated trucks ranging from 5,000 to 8,000 gallon capacity. Water tanks are available in scraper-mounted, articulated truck-mounted, and rigid truck applications. Each water truck is also built to your specifications to suit your needs and provide you a water pull with superior strength, performance, and dependability. Every operation is unique and requires a personalized approach, and no other tanker manufacturer understands that more than TrucksWorks. As experts who strive to remain ahead of our competitors, we are setting new standards for how water pulls are built by using SolidWorks, stress analysis and weight distribution simulations. By utilizing these advanced engineering design methods, we can help your water pull overcome the challenges drivers face, such as rollovers. The risk of vehicle rollover while operating on challenging off-road conditions with varying water levels is high so we engineer our trucks to be as resistant to rollover as possible. At TruckWorks, you get an entire water pull package that is fabricated with individualized components, engineered performance features, and long-lasting reliability. Want to further increase the durability and strength of your truck while putting a stop to corrosion? Our hot-dip galvanization option makes your water pull 100% corrosion resistant, increasing the lifespan and cost-efficiency of your truck. By submerging your tank into molten zinc, every corner and curve is sealed for protection. Coated inside and out, this patented process prepares your water pull for the largest of jobs without the risk of rust and corrosion standing in your way. Operating a water pull mounted with unused equipment is a waste of space and money. Own a truck that you have total control of, from the size of the tank to rigid neck or drop tank configuration to operating electric or manual hose reels, because having a truck you feel confident directing is the only way you can truly focus on the job at hand. Don’t see a specific feature you need? No problem! Give us a call and we’d be happy to work with you to find or create a solution for you! State-of-the-art engineering meets handcrafted fabrication to deliver trucks that meet your most exacting specifications in as little as six to eight weeks. Our tanks last longer. Here’s why. We’ve patented a hot-dip galvanized process for tanks to reduce corrosion. We’re always looking for ways to anticipate, innovate, and facilitate your on-the-job-success. Have questions or are ready to get started? Just fill out the form below and we’ll get in touch.